Για εκείνους που θέλουν να απολαύσουν τα αξιοθέατα και τους ήχους της πόλης Τιρουτσιράπαλι, το Hotel Deepam είναι η ιδανική επιλογή. Μόλις 1.1 Km από το κέντρο της πόλης και 10 Km μακριά από το αεροδρόμιο, αυτή η 3 αστέρων ιδιοκτησία προσελκύει πολλούς ταξιδιώτες κάθε χρόνο. Από τη βολική της τοποθεσία, η ιδιοκτησία προσφέρει εύκολη πρόσβαση σε κορυφαίους προορισμούς της πόλης. Με τις υψηλού επιπέδου υπηρεσίες και την μεγάλη ποικιλία ανέσεων, το Hotel Deepam δεσμεύεται ότι η διαμονή σας θα είναι όσο πιο άνετη γίνεται. Η ιδιοκτησία παρέχει 24ωρη φύλαξη, ημερήσιος καθαρισμός, δωρεάν WiFi σε όλα τα δωμάτια, ταχυδρομική υπηρεσία, υπηρεσία ταξί, φροντίζοντας για τη μέγιστη δυνατή άνεση των επισκεπτών. Επιπλέον, όλα τα δωμάτια διαθέτουν ποικιλία ανέσεων. Πολλά από αυτά παρέχουν ακόμη και επίπεδη τηλεόραση, προϊόντα καθαρισμού, κρεμάστρα ρούχων, δωρεάν ποτό καλωσορίσματος, λευκά είδη προκειμένου να ευχαριστήσουν ακόμα και τον πιο απαιτητικό επισκέπτη. Το ξενοδοχείο προσφέρει υπέροχες ψυχαγωγικές εγκαταστάσεις όπως οι αίθουσα γιόγκα για να είναι η διαμονή σας αξέχαστη. Όταν ψάχνετε για ένα άνετο και βολικό μέρος για να μείνετε στη Τιρουτσιράπαλι,το Hotel Deepam γίνεται το σπίτι σας μακριά από το σπίτι σας. Location walking distance to shopping area. Reception staff were warm, helpful & friendly. Many from Msia & Sg stay at tis hotel. Breakfast has limited varieties. Can add pancakes with maple syrup & some sausages/omelette. Traffic outside hotel can be heard horning from our room. Cons - pls provide complimentary breakfast to drivers who bring guest to the hotels. Drivers dont have proper rest area or bath/toilet facilities. This hotel is very near to the shopping place in Tricy. Nice hotel and the front desk staffs are good. Best hotel to stay if you plan for a shopping trip. Good hotel at the shopping area. Clean but the room size is little small. But that's ok for a short visit. Overall, recommended. We were a family with elderly as well as children accompanying. Hotel is difficult for elderly (no ramps, only stairs). Also, it is in the hustle and bustle of Trichy city. Parking is cramped and may be a challenge if too many cars in their basement parking. Otherwise, food and hotel facilities were good. I'm a frequent travel to this hotel, I was very upset when i was travel during november with friend's where i've booked 2 room's online, the water heather was down for 2 days . We have made several complain but not fixed until departure we were force took cold water every morning and night for shower. Even my sick friend whom follow me for treatment were force took cold water for bathing. 1st we thought it was heather in our room faulty and request to change another room so the staff did soo, but the problem is unsolved then finally we manage to find ou their water heather system is faulty and they kept quite. The worst scenario is we were checkout early morning to airport. Suddenly the staff asked us to pay since, and reason we have request to change another room and it was order from the manager . The hospitality in this hotel Good to Bad , not even a sorry and admit mistake for their problem.Even though most of the of staff know we are regular customer to this DEEPAM HOTEL. Staff were very rude, dishonest &unhelpful. Wifi does not work. Rooms are on the mainroad & so very noisy. No toilet paper in the bathroom. 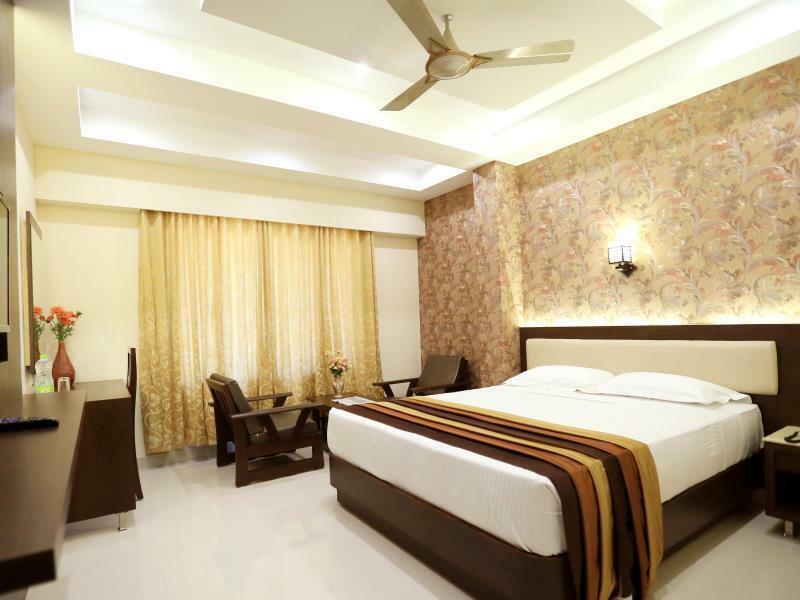 Good hotel at strategic location in Tiruchirapalli town. All shopping locations just walkable from hotel. The staffs helpful. Hotel should concentrate on air-conditioning in the rooms since the blowing is very low. This hotel is conveniently located especially for shopping. It is clean. Facilities are good. However electric kettle with tea and coffee making facilities should be made available. the suite room is good. Food is ok. Staff as usual very slow but helpful. Hotel doesnt have a proper drop out point, so got to be careful as it is very close to main road. Location wise, walking distance to Chennai Silks and Pothys. Great shopping. RamRaj is just next door to this hotel. The walking path for this 3 outlets, you will need to go thru the hotel restaurant then down staircase and then thru the non- AC restaurant then to the roads. The location is great! Walking distance to the Rock Temple and tons of street vendors. Two blocks to FSM Hypermarket, a good place to stock up on groceries. To go north and south (central bus stand or airport), take Bus #1! really satisfied with the money paid for this hotel. stayed 1 night with free breakfast. their food is awesome. even we took lunch here. no complaints on food. room condition is very good and look elegant. bathroom was clean and no complaint on coldness of air cond. heater is provided. they only provide towels. no other toiletries. very near to saradhas, pothys and rock fort area. if u dont like the hotel food, banana leaf restaurant is there in walking distance. our lady of lourdes church is walking distance. 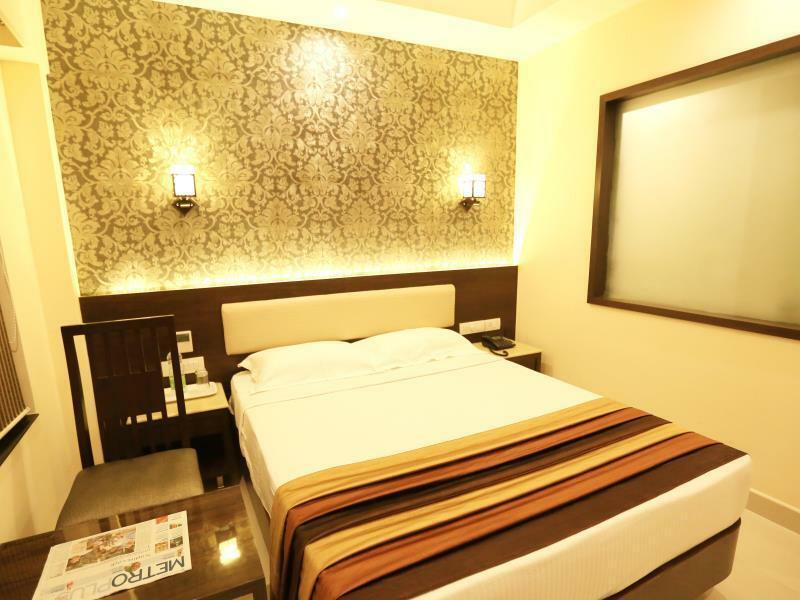 basically the hotel is situated in a very strategic place in tiruchi. we love to stay again in deepam hotel. I would suggest this hotel to couples or solo travelers..The room size was very small and not suitable for traveler bringing their family. 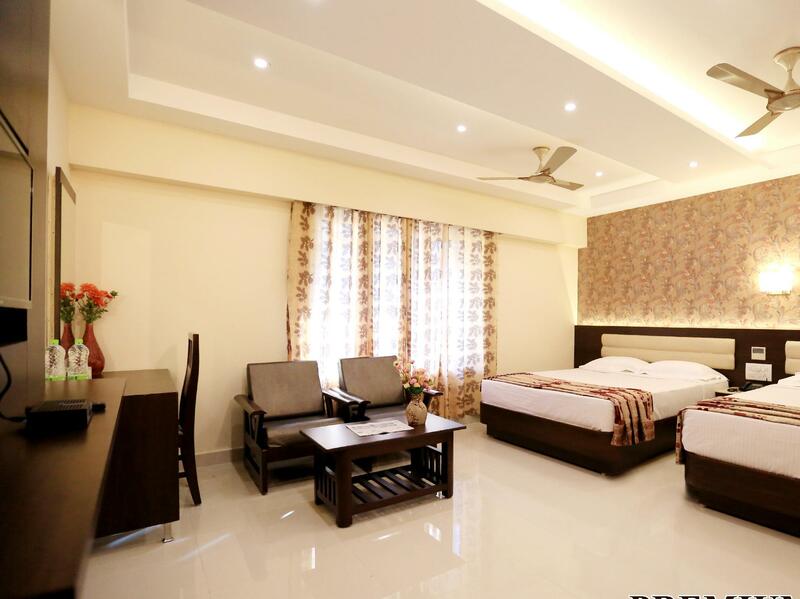 this is a newly opened hotel so the rooms are very clean..plus located in very strategic location..walking distance to shopping area and temple. Room is super clean and catered as requested. Pleasant stay with family. Easy access to lot of places. 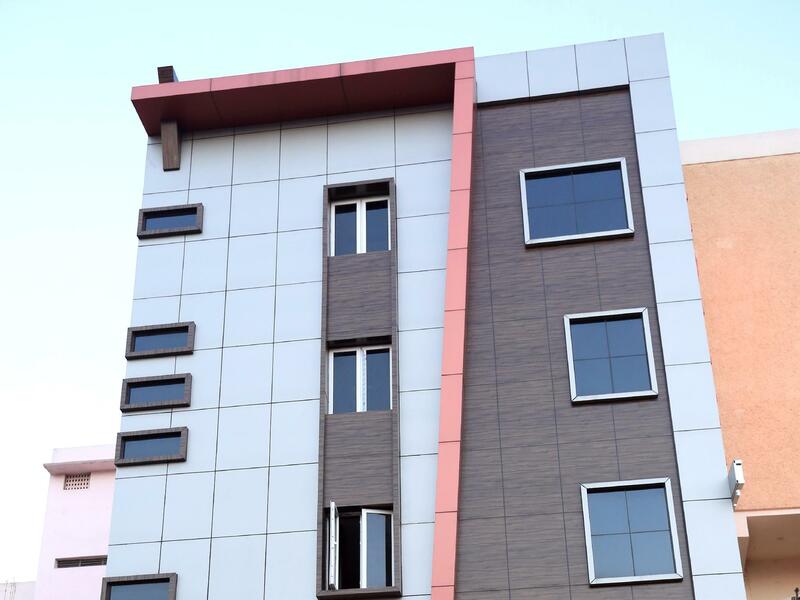 Walking distance to shopping places like Chennai Silks, Sharadha Street and Mangal & Mangal. Receptionist are responsive and travels car arranged by the hotel provide good service and reasonable price. No haggling or change of tariff in mid journey. The food at their restaurant is good.. Worth the money. Cons : Though early check-in was requested and rooms were available, staff denied early check in and charged hefty. Rooms are conjusted and no hot water. Staff said it's due to winter and temperature drop due to which their solar panels are not picking up. Sounds funny to me. Buffet breakfast was pathetic. Dusty rooms. Don't see even a single pro to mention. Never ever recommend this hotel for anyone. Lot of other hotels with better price and options available to stay.